You’re ready to buy a rabbit hutch. A good place to start looking is, of course, online. Any search engine will bring up page after page of sites that sell pre-fab rabbit hutches. There are countless photos of rabbit hutches and a wide range of prices, from $40. US to over $300. US. You need to consider what your usage of the hutch is going to be. Your requirements are largely based on the locality in which you live. If you are in an urban area, there’s not much danger from wild predators but you do have to watch out for unattended dogs. There is always the presence of rats to consider. You must keep your rabbit’s cage clean and the area around it clean as well. A slide out tray is a necessity to catch waste and uneaten food. It must be emptied regularly. You need the hutch to be well ventilated, have a slant roof for rain run-off and be protective in inclement weather. In a suburban area, your needs change. You must be aware that there is the occasional danger from raccoon and coyotes. You need to decide where to put your hutch, preferably in partial to full shade. Will the hutch be raised off the ground or will it sit on the ground? If sitting on the ground, do you need an attached floor on your rabbit hutch? Some rabbits can dig a hole and be out of their hutch in 30 seconds. If you have a digger, you need an attached floor. If you see no danger of that, be sure to lay a thick layer of hay on the ground, as some dirt and many grasses are harmful to rabbits. In a rural area, there is a strong likelihood of the presence of wild predators. 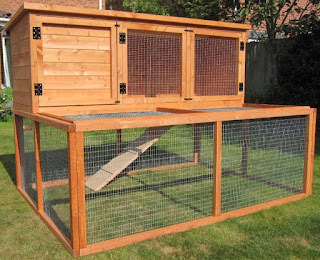 A hutch in this environment must be lifted up to 4 feet off the ground, the doors should be tight fitting and the hinges and locks should close flush to the exterior of the structure. In any of these scenarios, you should remember that a rabbit hutch should not be used as the primary habitat for your rabbit. If you have bought him for a pet, he needs to be with you and socialized and happy. It is not recommended to leave a rabbit in an outdoor hutch for long periods of time and never overnight. You have choices in the materials used in the construction of your rabbit hutch. Many hutches are made of untreated pine lumber and galvanized steel mesh. Untreated pine lumber can be colored with safe vegetable dyes and stains. There are other woods that are safe if they are chewed on by your rabbit. One example is maple. It is sturdier and longer lasting than pine and resists mold. Another option is a molded compound material of recycled polymer plastic and wood by-products. The advantage to this is that it is moisture resistant, does not crack or warp and is “eco-friendly”. As with wood, this material is not chew proof and it is also hazardous if ingested. The wire mesh used on the hutch should be galvanized steel, which does not rust. With spacing of ½ in x ½ in. or maximally 1 in by ½ in on sides and top and ½ x ½ in on the bottom, preferably 14 gauge. Styles range from basic, functional hutches to quaintly decorated, multi-story “houses” with shuttered windows and picket fences. Many have attached rabbit runs. In considering your purchase, you should keep in mind that a rabbit requires plenty of room to hop around and thump and proper height for him to stand on his hind legs. A rabbit run is a good way for your rabbit to get vigorous exercise and “bink”. Some hutches are marketed as multi-functional housing for many different kinds of small mammals and fowl. Consider the size of your rabbit and if this kind of hutch is appropriate for him. Be sure that ramps are wide and sturdy enough for him and that there is plenty of room and ventilation. While in his hutch, a rabbit is getting a nice change of scenery and fresh air. But he still requires stimuli to keep him engaged and happy. Provide toys and occasional treats to keep him busy. His hutch should be a place he likes to go, not a cage. Features to look for are slide out trays, built-in holders for food and water crocks, a slant roof for rain water run-off, areas for resting, eating and a place to “go”. If you have a rabbit that is litter box trained, you want him to keep that behavior up. Buy a hutch that has room for a litter box. There should be room for the placement of a plywood board or sturdy piece of cardboard for scratching, thumping and comfort. Short haired rabbits and the giant breeds suffer from sore hocks when left solely on wire mesh. Searching for the right rabbit hutch for your rabbit can be fun and educational. There is always something new to learn about habitats, breeds, proper diet and socialization. Even tricks that you can teach your rabbit. If you are purchasing a rabbit hutch online and intend to assemble it yourself, prepare for pages of instruction and quite a bit of manual labor. 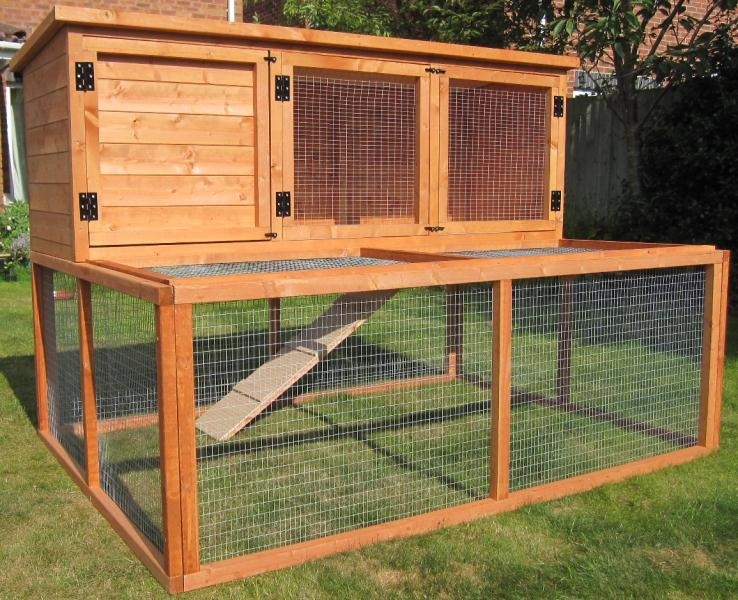 If you are DIY challenged, you might want to consider hiring a handy man to construct your rabbit hutch for you. You want it to be sturdily put together, properly placed and completely sound for your rabbit. If built in such a way, a good rabbit hutch can last for many years. Your local feed store can be a great source for advice on rabbit care and feeding, housing requirements and an economical place to buy hay, rabbit pellets and any supplies you need to keep your rabbit comfortable and thriving. Stop buy and speak to your feed store clerk about other rabbit owners that they know in your area with similar needs in the purchase of rabbit hutches.